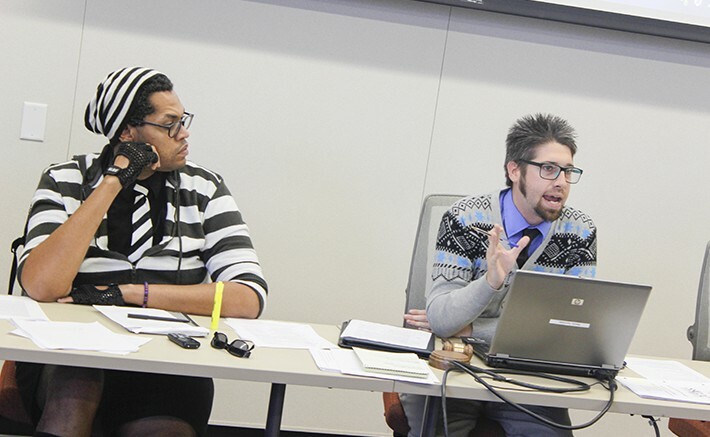 Student Senate President David Hylton, right, narrowly avoided being recalled in an election on eServices this week (Photo by Jordan Schauberger). Associated Student Body Student Senate President David Hylton will not be recalled from his position. It was announced, prior to the Senate meeting Thursday, that although 72 percent of the students who voted wanted to recall him, the required amount of 75 percent was not met. Hylton, who became acting president after Student Senate President Garrett Kegel and Vice President Sam Kinsey abruptly resigned at the end of September, had come under fire due to comments questioning the conduct of Israel and supporting Student Trustee Cameron Weaver, who said he was “skeptical” of the Holocaust. The board approved a resolution that calls for the Student Senate president to give a monthly address that will provide ARC students with updates on the work that ASB is doing. Bills of $3,000 and $2,000 were approved by the board to fund a donation to the Student Senate for California Community Colleges (SSCCC) and travel reimbursements for board members traveling to and from advocacy events. General Assembly is a conference put on by SSCCC for Student Senates in California and it is set of the weekend of Nov. 14. A third bill was made a consent action item and approved $150 to buy microwave covers for the microwave in the Student Center. A resolution was presented to the board to encourage Disabled Student Programs and Services (DSPS) to provide American Sign Language (ASL) interpreters for every event on campus instead of waiting for students to request them. Director of Legislative Affairs Laurie Jones, who authored the resolution, claimed that she was just calling for there to be more interpreters at school events, not intending to spearhead the entire operation. The board also begin voting on how they want the ARC delegate to vote on resolutions that will be presented at GA. The ARC delegate is Director of Legislative Affairs Laurie Jones. The board voted yes on the four resolutions that they were able to get to out of the 38 that are being presented at GA. Although the board voted yes on the resolutions, several board members repeatedly abstained from voting. Hylton was not pleased with the constant abstention of board members. The resolutions were to mandate for the SSCCC to put on March in March, in support of the America’s College Promise Act, to encourage for all California community colleges to improve or implement a student learning center and to endorse funding post-secondary education for foster children. Be the first to comment on "Student Senate president survives recall effort"